Online ticket sales end 1 hour before showtime. Please purchase tickets in the Main Lobby at Clarke Recital Hall after 7:00pm on March 17, 2018. This concert will start promptly at 8:00pm. Please arrive with plenty of time to find parking and to settle into your seat. 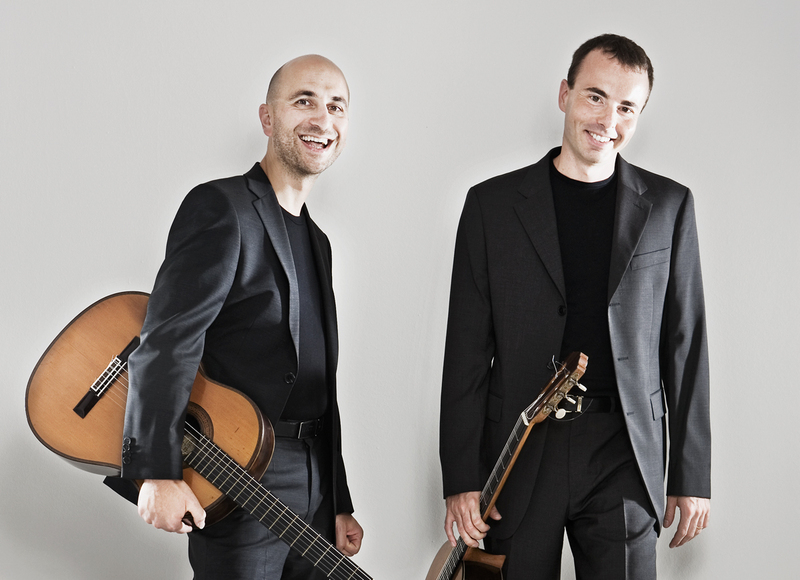 In addition to classic, romantic and modern repertoire, Matteo and Lorenzo – joined by lutenist Massimo Lonardi – have extensively explored Italian music from the XVII and XVIII century for baroque guitar and theorbo. Together, Matteo and Lorenzo have recorded François de Fossa’s Three Quartets, op. 19 (2004), a CD of 17th Century Italian music for baroque guitar, archlute and theorbo (“La Suave Melodia” with Massimo Lonardi, 2008), a CD of Arias and Cantatas by Alessandro Scarlatti (“Clori, ninfa e amante”, 2013), an anthology of 20th Century masterpieces for two guitars (“Solaria”, 2007), the Duos Concertants by Antoine De Lhoyer (2007), a collection of chamber works by Mauro Giuliani (2008), a collection of 19th Century pieces for two guitars (“Noesis”, 2009), the Sonatas of Ferdinand Rebay (2010), the 24 Preludes and Fugues by Mario Castelnuovo-Tedesco (2012), and the album “Metamorphoses” (2014), as well as a dozen solo recordings on the labels Naxos, Brilliant, Contrastes, Kookaburra, Mel Bay, and Stradivarius. They are the Editors of the “SoloDuo Collection” for the Canadian publisher Productions d’Oz. Matteo resides in Geneva, Switzerland, where he teaches at the Conservatoire Populaire. Lorenzo lives in Milan, Italy, and teaches at the University School of Music in Lugano, Switzerland. Since 2015, they are Artists in Residence at the University of Colorado Boulder. Matteo Mela was born in Imperia in 1971. A student of Renzo Doria Miglietta in his hometown, he moved to Cremona to pursue his studies of musicology at the University. In Cremona he met Giovanni Puddu, who played a major role in his musical education; at the same time, he had the chance to attend the classes of Angelo Gilardino, Alirio Diaz, Oscar Ghiglia, David Russell, the Assad brothers. Moreover, he studied chamber music at the Accademia Pianistica di Imola with Dario De Rosa, Alexander Lonquich, and Pier Narciso Masi.As a member of the Mela-Bandini duo Matteo won – between 1991 and 1998 – the first prize in several prestigious chamber music competitions, such as the Aram (Rome) 1992, the F. Cilea Competition in 1993, the GMI in 1994, the Città di Gubbio, Città di Caltanissetta and Perugia Classico Competitions in 1995. A teacher at the Conservatoire Populaire de Musique in Geneva (Switzerland), Matteo records regularly for the labels Naxos, Mel Bay, and Stradivarius. Lorenzo Micheli has taken up a busy concert career throughout the world since winning the first prize in some of the most prestigious guitar competitions (Alessandria, “Guitar Foundation of America Competition”). He has played more than 600 concerts all over Europe, in two hundred US and Canadian cities, in Africa, Asia and Latin America, as a soloist and with orchestra. Since 2002 Lorenzo has been performing worldwide in duo with Matteo Mela – under the name of “SoloDuo” – in such venues as New York’s Carnegie Hall, Seoul’s Sejong Hall, Kiev’s Hall of Columns and Vienna’s Schubertsaal. Their duo was welcomed by “The Washington Post” as “extraordinarily sensitive – nothing less than rapturous”. His discography (over 20 titles in 15 years on the labels Naxos, Stradivarius, Pomegranate, and Soundset) includes the music of Dionisio Aguado, the Quartets, op. 19, by François de Fossa, the Sonatas by Viennese composer Ferdinand Rebay, a CD of 17th Century Italian music for baroque guitar, archlute and theorbo, a collection of Arias and Cantatas by Alessandro Scarlatti, the complete guitar Concertos and the 24 Preludes and Fugues for two guitars by Mario Castelnuovo-Tedesco, a double CD of chamber masterpieces by Mauro Giuliani, Miguel Llobet’s complete guitar works, Antoine de Lhoyer’s Duos Concertants, three anthologies of music for two guitars (“Noesis”, “Solaria” and “Metamorphoses”), and the album “Morning in Iowa”, with former Dire Straits member David Knopfler. His latest recording, “Autumn of the Soul”, was released by Contrastes Records in November 2014. A very active editor and researcher, Lorenzo has published solo and chamber works with guitar by such composers as Mario Castelnuovo-Tedesco and Ferdinand Rebay. He is in charge of a collection of guitar music for the Canadian publisher “d’OZ”. Lorenzo lives in Milan, Italy. He has served on faculty at the University School of Music (Musikhochschule) in Lugano, Switzerland, since 2011, and he is Artist in Residence at the University of Colorado.